Workstation with at least 512MB RAM, Pentium 4 or AMD CPU. By default Windows 10 does not have the ability to preview PDF files like images in Windows Explorer or other apps like Office 2010. 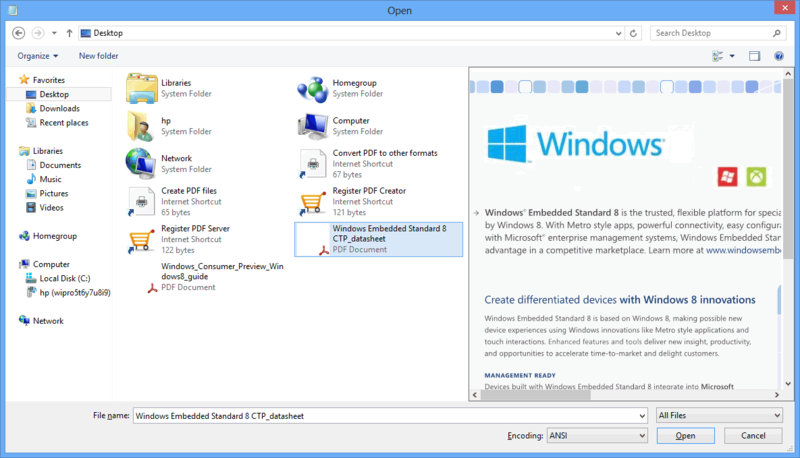 PDF Preview allows PC users to preview PDF file in Windows 10 without opening. This freeware tool installs PDF Preview add-in for Windows Explorer, Microsoft Office, and Microsoft Outlook, and automatically configures itself to preview a PDF file in the Preview pane of Windows Explorer or in the Reading pane in Outlook 2016, 2013, 2012, 2010, 2007. This freeware program is specifically designed for Windows 10, and works on both Windows 10 64-bit and Windows 32-bit systems. The software outperforms its peers both in speed and stability. PDF document can be previewed in thumbnail when it is not opened via the Preview Handler interface in Microsoft Windows 10. PDF Preview for Windows 10 gives your PDF files a high-quality preview thumbnail. On Windows 10 64-bit operating system, PDF Preview works as twice as much faster than on 32-bit. This product is designed for Microsoft Windows 10 x64 (64-bit) and x86 (32-bit), and is NOT backward compatible with Microsoft Windows 8, Windows 7. However, Windows Server 2016, Windows Server 2012 are the other supported operating systems.